The harness system in structure of the parachute system is to execute 2 functions – to attach the body of a skydiver to a parachute and to serve as a base for parachutes’ containers. At the designing stage of the harness system it is crucial to solve three basic issues: how to provide the estimated strength, how to provide comfort for a parachutist (both on land and in the air), and to provide functioning of deployment bags (in various situations of opening). 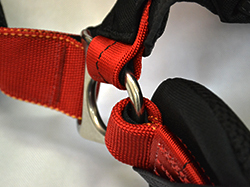 The Fire harness system is made of Type 7 and Type 8 Mil-Spec MIL-W-4088 webbing made in the USA. This allows us to provide true comfort and to meet all the strength requirements. When designing the harness we used an approach titled as Wrap – Around. The webbings are not just laid over one another to be sewed, but are wrapped around one another. 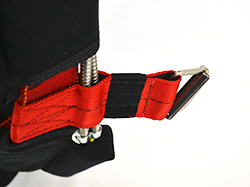 This guarantees that even in the worst cases, such as deployment at extremely high vertical speed or jumping a worn system with even deteriorated stitches attaching the webbings together, the parachutist will be securely attached to the harness. The harness system is wrapped around hip rings in the same way as it is wrapped around the webbings. This allows avoid bending of the harness that may emerge within adjusting the harness over the body. Having removed any bends, we managed to provide equal load for the webbings of the harness which significantly increases the strength of harness as a whole. SWS Company can be proud of its’ production as the harness systems made by SWS are considered to be among the most comfortable and the strongest in the world. For us your comfort and safety mean a lot, this is why we do not produce harness systems without hip rings. The harness is attached to a specific spot of the container – on the back. The back of the container is to provide comfortable adjustment of the harness on the body of a sportsman. Also it serves as a protective shell to secure the harness from UF rays and physical wear. 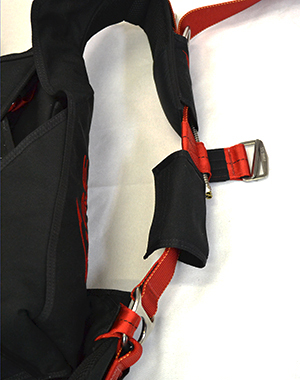 This element provides not only survival for a skydiver but comfort while being fully equipped. The structure of the back of the container will provide comfort both in air and on land as well as safety of use and operating life. Several elements described further in this section make the back of Fire container even more comfortable.